The markets were mixed last week as the U.S. dollar started on a weaker note, but managed to regain some of the losses by Friday’s close. The rebound in the U.S. dollar came as U.S. President Trump said that he would be making an announcement on tax reforms in the coming weeks. His comments spurred a rally in the markets rejuvenating the Trump rally which started to lose steam on lack of further directives from the U.S. President. The Japanese Prime Minister, Shinzo Abe is in the U.S. for an official visit. The markets are nervous following the allegations of currency manipulation that was levied by U.S. officials. While Japanese officials were quick to dismiss the allegations, the fact that a weaker Japanese yen supports the export oriented country still weighs on trader’s minds. Investors are therefore a bit concerned on how the events will turn. Elsewhere, last week saw the RBA, the RBNZ and the Bank of Mexico set their monetary policies. The RBA and the RBNZ held interest rates steady. The RBNZ surprised with some dovish news as the central bank officials said that the rate hikes will come only next year, disappointing investors who expected to see a faster pace of rate hikes following an increase in the nation’s inflation and also the rise in the quarterly inflation expectations. The Bank of Mexico was seen hiking rates by 50 basis points last week, bringing interest rates to 6.25%. The rate hike was widely expected by economists as the central bank is battling higher inflation and a weaker exchange rate. It was only in January that the central bank sold U.S. dollars to help prop up the Mexican peso. The rate hike last week helped the peso a bit as the currency continued to strengthen for a third consecutive week against the U.S. dollar. FTSE100: FTSE100: As noted last week, the FTSE100 has been in a bullish trend as the index retraced the declines from the week before. Expect some near term gains towards 7275.00 and a lower high to be formed at this level. The Stochastics oscillator is showing a possible bearish divergence near 7275.00 which will indicate a near term decline in prices. Support is at 7125.00 followed by 6975.00 which is the final target to the downside. In terms of risk/reward set up, the short position will be invalidated on a close above 7355.75, thus giving a very favorable set up. EURUSD: EURUSD fell to 1.0611 last week but we can expect a near term retracement is price doesn’t continue lower towards 1.059 – 1.057 support level. In this instance, there is a strong chance for EURUSD to rally back to 1.0711 where the breakout from the pitchfork will be retested and thus offering new levels to short EURUSD from. The support near 1.0590 – 1.0570 is quite likely to be tested and if EURUSD continues lower, then this support is ideal to go long from. 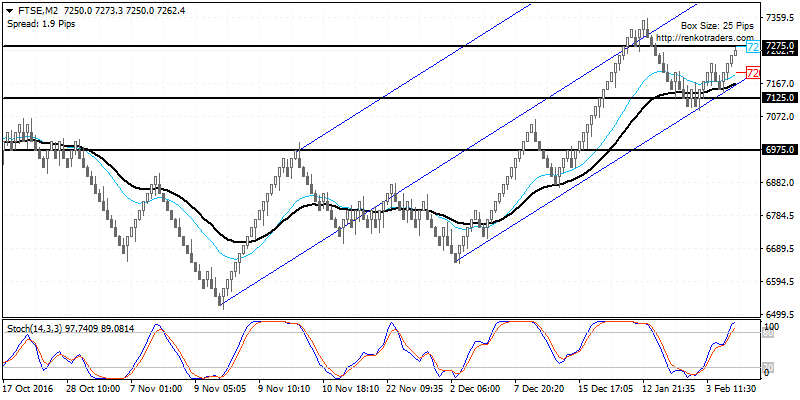 XAUUSD: The rally in gold prices are showing signs of exhaustion. This was evident after last week, President Trump promised that he would soon announce tax reform plans, that is positive for the U.S. dollar and risk assets. Gold prices are most likely to see another modest leg to the upside with 1239.56 coming in as the main resistance level. 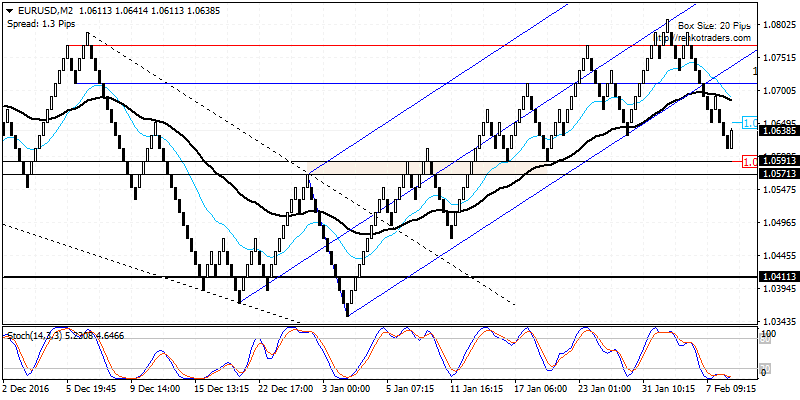 A retest to this level will form a double top pattern on a bearish divergence on the Stochastics. A reversal near 1239.56 will signal the downside towards 1214.56 initially followed by 1209.56. 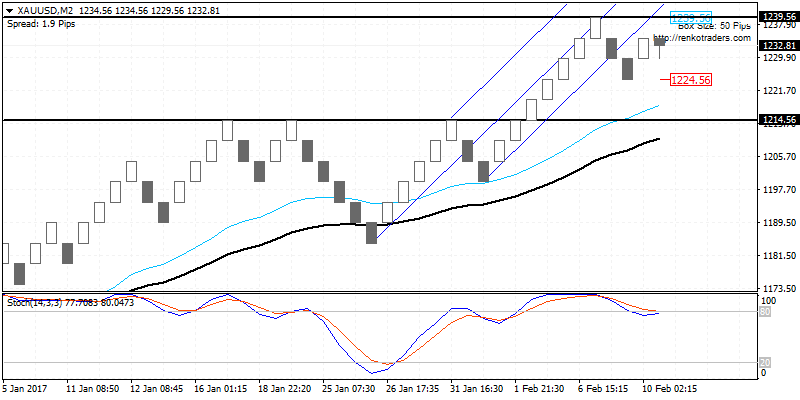 USDJPY rallied towards 113.60 last week before giving up some of the gains. 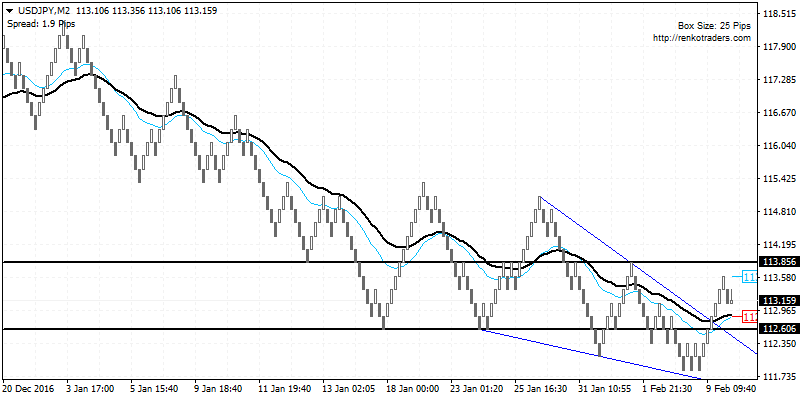 The bias is building up to the upside following the breakout of the falling wedge pattern. Expect the near term declines to slide towards 112.60, from where USDJPY could be seen posting a strong rally towards 113.85 at the very least. A continuation above 113.85 will see USDJPY test the previous high near 114.70. Alternately, a break down below 112.60 and towards 112.09 will signal an invalidation of the bullish bias. The week ahead will see inflation figures coming out of the UK, the U.S. and China. Inflation is expected to rise across the board, but traders will be focusing on the inflation figures from the U.S. and the U.K. Consumer prices in the UK are expected to rise 1.9%, closer to the BoE’s 2% inflation target rate. Besides inflation report, the monthly retail sales and jobs report from the U.K. will also be coming out this week. The Fed Chair, Janet Yellen will be speaking this week giving her semi-annual testimony to Congress. Following the Fed’s neutral stance at the early February FOMC meeting, the markets will be looking at Ms. Yellen’s comments this coming week especially as the Fed continues to expect to hike interest rates three times this year.